Students enrolled in design or drafting courses in school are given the opportunity to win scholarships and awards for their skills. 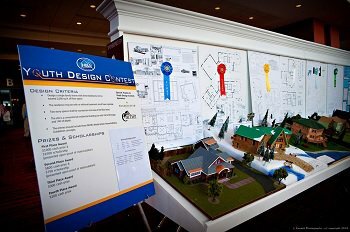 Students in grades 10 – 12 are asked to build a scale model home with presentation drawings, based on specific criteria we set each year. The first place winners are awarded a $1,000 cash prize and $1,500 college scholarship! Johnny Carrier is a member of the Connecticut Codes and Standards Committee, which reviews and recommends the building code for the state. He accepted to serve on the residential building seat in August 2017, upon recommendation from the Home Builders and Remodelers Association of CT to the Commissioner of the Department of Administrative Services. The 21-member committee is comprised of stakeholders from various industries, who review and recommend building codes to the Legislative Regulation Review Committee. This process determines the overall set of building codes that are followed by all towns in the state. As a member of the Codes and Standards Committee, Johnny also hears appeals, when proposed building codes are denied by the State Building Inspector or fire marshal’s office.